Here at NWA Great Danes, we take pride in raising our pups the right way. No Kennel kept, crying puppies here. All our pups are AKC registered, up-to-date on their shots, and dew claws removed. As you can see in the pictures below, our puppies are raised in a loving environment with their mommy and daddy. The key to raising well socialized puppies is by allowing them to roam, sniff, smell, dig and learn from the environment around them. Also by having the pups interact with people from the get go. Here at NWA Great Danes we make sure our puppies have quality, purposeful interactions with adults and kids alike. Ensuring the highest quality personalities, ready to bond with the families they are placed with. Other breeders put emphasis on colors, pattern, eye color, body type, - physical attributes. Not that way here at NWA Great Danes. While we understand there are attractive physical attributes people look for in a puppy. We focus here on quality of life, quality of raising, quality interactions. 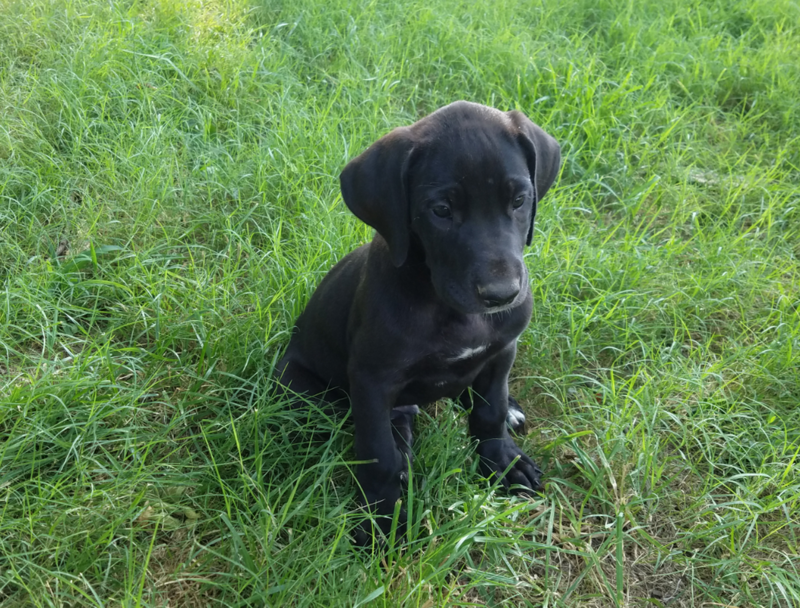 Only by focusing on these important points in a puppies growth and development will the ground work of a loving relationship between pet and owner be established. 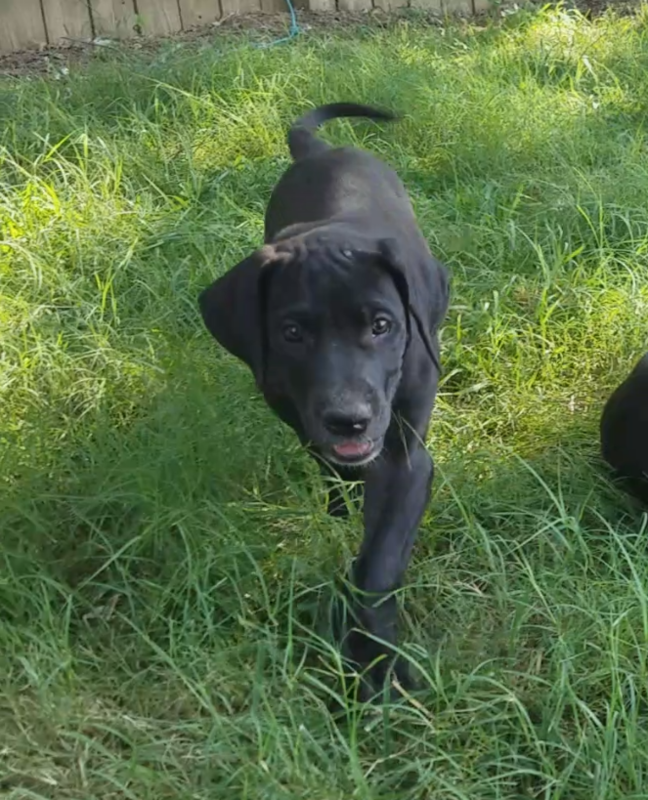 As you will hear us say, and post about, we are interested in finding these pups a "forever home." Our Danes are a part of our family, and we have a vested interest in finding families that feel the same. Our care, attention, and protection of these beautiful unique creatures includes interviewing their potential owners to make sure they hold our same values, and that these bundles of joy are going to a life-long (literally) loving friend and owner. No point in getting an un-socialized pretty dog, if that dog ends up being a jerk to deal with (best case scenario), or a danger to your family (worst case scenario). These principles guide our interactions with our litters and our customers. We don't sell to just anyone, if we don't sense a comrade of these loving principals in our potential buyers we wont part with our little darlings, (for any amount of money). 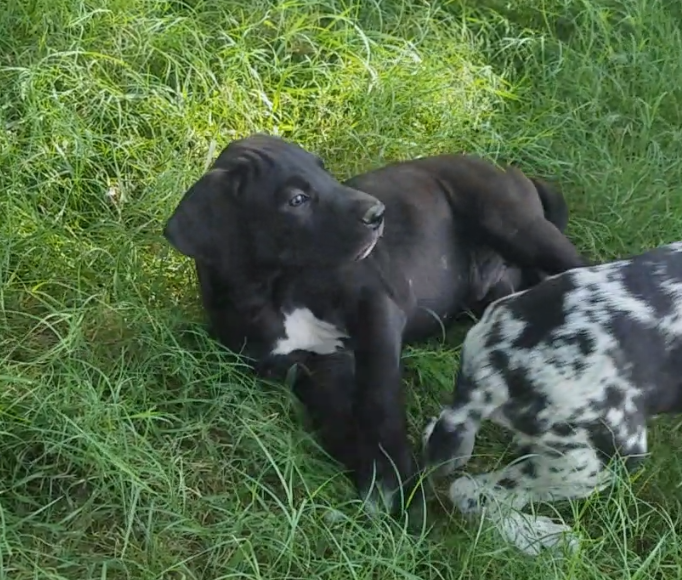 If you are moved by these guiding principals, and want to share your family with one of these baby Danes give us a call today! 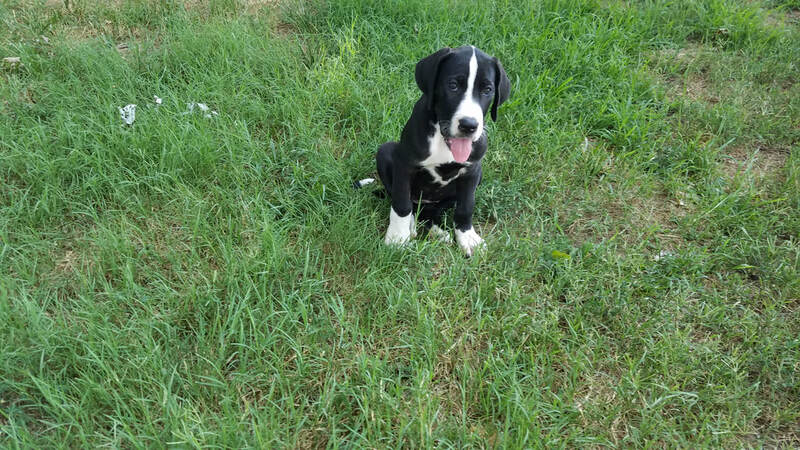 ​Cute male, black coat white chest 8 weeks, just like the rest, he's a bit of a morning pup. Lots of energy to run around in the day, and laze around in the afternoon. Loves to cuddle and snuggle. ​This is our last available Female of the season. She is a beautiful Mantle. The cute energetic little one, loves to play and is great with the kiddos. ​She's ready to come home with you! If this cutie suits your fancy give us a call today and we'll begin the review process! ​Can't help but love these adorable little guys. Here is another one of our males. A good pack animal, as they all are. Playing with one of his sisters in this pic. He'd love a good forever home where he'll get plenty of lovin and attentions. ​No fuss, no muss. 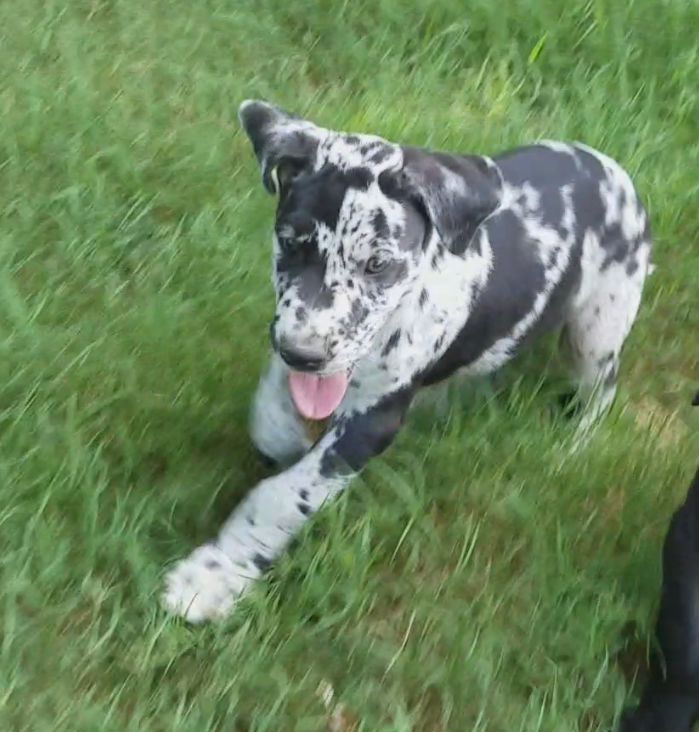 If you want a loving, adorable, low maintenance dog Great Danes are the breed for you. Take this guy home and fill those boring walls with love and fun! Here is our last Male of the season. This Blue Merle loves to play as much as he loves to rest and bask in the sun. 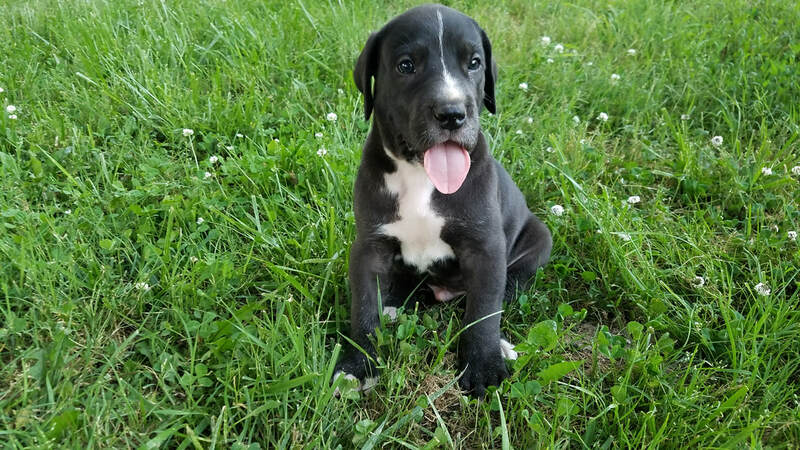 Give this guy your forever home today!